There's a cool exhibition at the New York Public Library right now. It's called "Lunch Hour NYC". It brought up all sorts of good memories for me, but I especially loved being reminded about Horn & Hardart Automats. 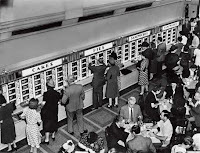 The only real Horn & Hardart Automat was the one on 42nd Street, across from Grand Central. I used to adore that place. In my dissident teens, I'd go there at 1 or 2 in the morning, just to see the people. It was terrific. Among the customers were hustlers, queens, travelers, beatniks transforming into hippies, night-shift workers, cops -- just all sorts of people. I couldn't get enough of it. And in those sophisticated days, you could smoke at your table. I'd fetch a black coffee for 15 cents (three nickels; you had to have nickels at the automat) and smoke myself into a coma. Pall Malls, unfiltered. The Automat was exciting to me when I was 16. I wasn't just a dumb teenager, either. I was reading underground novels at a furious pace, so I understood exactly who these people were. It was so cool to be there with them! Anyone else have memories of those days, or old-time eateries? The article mentions the 2nd Avenue Deli, too. I worked a block from this deli in the 60s, and bought a sandwich there every workday. It's fun to waltz through old memories. Unless you're an oldster like me, you don't realize how completely that old world has vanished. It's like it was literally replaced by a new reality.